Sandbot v0.4.2 released - . :: Bots United ::. Sandbot v0.4.2 has been released! - [All] Made bot_skill a cvar which dynamically changes a bot's skill. - [All] Fixed bots attacking bots that had been kicked. - [All] Bots will now be removed if the quota exceeds the bot_count cvar. - [All] Enabled debug logging in release builds with bot_log_level cvar. - [Windows] Sandbot no longer breaks level transitions in single player (thanks shardthefox200@ModDB). - [Opposing Force] Made bots less likely to get distracted by enemies when they have the flag in CTF. - [Natural Selection] Fixed crash in Classic mode when a gorge checked if it should build a resource tower. - [Natural Selection] Fixed bots doing the opposite of what they should when approaching unbuilt resource towers in Classic mode. Last edited by tschumann; 21-04-2018 at 23:41..
1. Unlike previous version which Sandbot (along with HPB_BOT) plays so aggresive to capture enemy's flag. In this version, they are more to defensive playing style rather than offensive. Sometimes they could take a flag and even capturing it, but it's very rare. 3. Look at this screenshot. Perhaps you think if they are trying to kill their enemies. If so, no problem right? Yes, as long if both of them are members from different team. But this? Believe it or not, they are FRIENDS ON THE SAME TEAM (Black Mesa). But why they're hit each other? 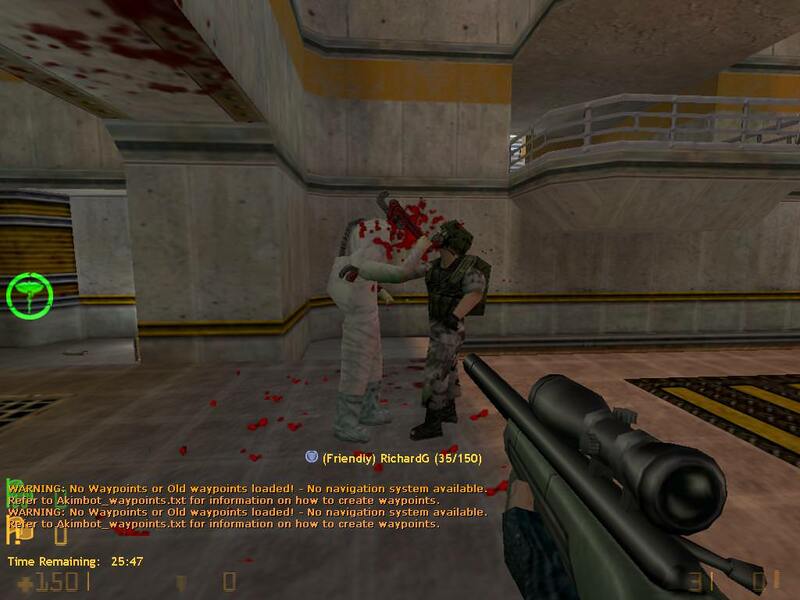 And why the man on the right side is a member from Black Mesa but using a model from Opposing Force team? This will make me so confused to fire at right opponent because I couldn't figure if they are my friend or not. Yeah the flag capturing still isn't perfect but I tried to get it to a point where the bots could at least get the enemy flag (actually getting a point is rare I agree but currently bots can't work out whether to prioritise a flag or an enemy). I'm not sure why the bot would go back to their own base - taking a look at the code I can see that they'll only go back their own base if they have the flag. Not sure what's going on with bots attacking each other there - I get the bot team from attributes set by the game .dll, though it could be that there was a spectator in that exact location that they were both attacking (known bug that bots will try and attack spectators - still haven't worked that one out yet). Yeah different models would explain it. Old waypoints should be fine (I haven't changed anything in the last few versions) but the bot thinking code is long and complicated (I'm slowly trying to tidy it up) but it's possible that in some situations bots will do the wrong thing. How about bot_count and bot_names? I haven't looked at the bot names thing yet - still more tidy-up required before I try and tackle that. By the way, is possible to make Sandbot works well to be played in Natural Selection on Classic Mode? Because they just using pistol whenever I give them a weapon. Don't worry about build a structure, for now I can simply leave it to Whichbot or Hivemind AI.